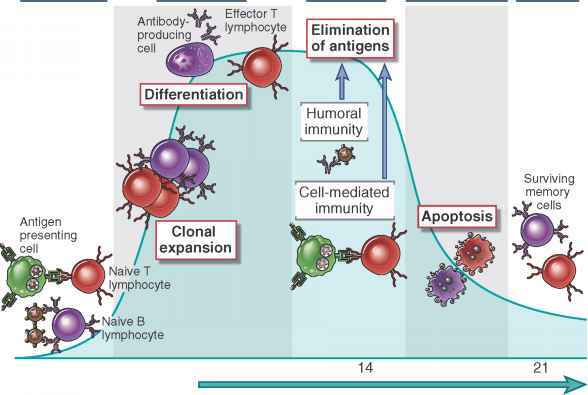 FIGURE 1-6 Phases of adaptive immune responses. Adaptive immune responses consist of distinct phases, the first three being the recognition of antigen, the activation of lymphocytes, and the elimination of antigen (the effector phase). The response contracts (declines) as antigen-stimulated lymphocytes die by apoptosis, restoring homeostasis, and the antigen-specific cells that survive are responsible for memory. The duration of each phase may vary in different immune responses. The y-axis represents an arbitrary measure of the magnitude of the response. These principles apply to humoral immunity (mediated by B lymphocytes) and cell-mediated immunity (mediated by T lymphocytes). 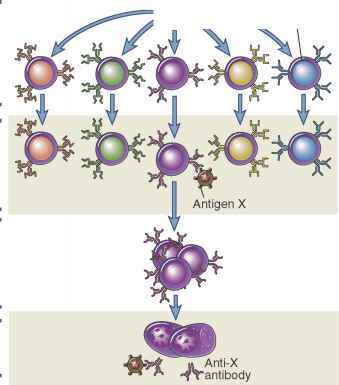 Lymphocytes specific for a large number of antigens exist before exposure to the antigen, and when an antigen enters, it selects the specific cells and activates them (Fig. 1-7). This fundamental concept is called the clonal selection hypothesis. It was first suggested by Niels Jerne in 1955, and most clearly enunciated by Macfar-lane Burnet in 1957, as a hypothesis to explain how the immune system could respond to a large number and variety of antigens. According to this hypothesis, antigen-specific clones of lymphocytes develop before and independent of exposure to antigen. A "clone" refers to a lymphocyte of one specificity and its progeny. A characteristic of the immune system is that a very large number of clones is generated during the maturation of lymphocytes, thus maximizing the potential for recognizing diverse microbes. The activation of naive T lymphocytes requires recognition of peptide-MHC complexes presented on dendritic cells. The nature of the antigen that activates T cells (i.e., peptides bound to MHC molecules) ensures that these lymphocytes can interact only with other cells (because MHC molecules are cell surface proteins) and not with free antigen. This feature is necessary because all the functions of T lymphocytes are dependent on their physical interactions with other cells. To respond, the T cells need to recognize not only antigens but also other molecules, called costimulators, which are induced on the APCs by microbes. Antigen recognition provides specificity to the immune response, and the need for costimulation ensures that T cells respond to microbes (the inducers of costimulatory molecules) and not to harmless substances. B lymphocytes use their antigen receptors (membrane-bound antibody molecules) to recognize antigens of many different chemical types. Engagement of antigen receptors and other signals trigger lymphocyte proliferation and differentiation. The reactions and functions of T and B lymphocytes differ in important ways and are best considered separately. FIGURE 1-7 The clonal selection hypothesis. Each antigen (X or Y) selects a preexisting clone of specific lymphocytes and stimulates the proliferation and differentiation of that clone. The diagram shows only B lymphocytes giving rise to antibody-secreting effector cells, but the same principle applies to T lymphocytes. microbes. Some effector T cells of the CD4+ helper cell lineage secrete cytokines that recruit leukocytes and stimulate production of microbicidal substances in phagocytes. Thus, these helper T cells help the phagocytes kill the infectious pathogens. Other CD4+ effector T cells secrete cytokines that stimulate the production of a special class of antibody called immunoglobulin E (IgE) and activate leukocytes called eosinophils, which are able to kill parasites that may be too large to be phagocytosed. As we discuss next, some CD4+ helper T cells stay in the lymphoid organs and stimulate B cell responses. Activated CD8+ lymphocytes proliferate and differentiate into CTLs that kill cells harboring microbes in the cytoplasm. These microbes may be viruses that infect many cell types or bacteria that are ingested by macrophages but escape from phagocytic vesicles into the cytoplasm (where they are inaccessible to the killing machinery of phagocytes, which is largely confined to vesicles). By destroying the infected cells, CTLs eliminate the reservoirs of infection. On activation, B lymphocytes proliferate and differentiate into cells that secrete different classes of antibodies with distinct functions. The response of B cells to protein antigens requires activating signals ("help") from CD4+ T cells (which is the historical reason for calling these T cells "helper" cells). B cells can respond to many nonprotein antigens without the participation of other cells. Some of the progeny of the expanded B cell clones differentiate into antibody-secreting plasma cells. Each plasma cell secretes antibodies that have the same antigen-binding site as the cell surface antibodies (B cell receptors) that first recognized the antigen. Polysaccha-rides and lipids stimulate secretion mainly of the antibody class called IgM. Protein antigens induce the production of antibodies of functionally different classes (IgG, IgA, IgE) from a single clone of B cells. The production of these different antibodies, all with the same specificity, is called class switching and requires the action of helper T cells; it provides plasticity in the antibody response, enabling it to serve many functions. Helper T cells also stimulate the production of antibodies with increased affinity for the antigen. This process, called affinity maturation, improves the quality of the humoral immune response. The humoral immune response combats microbes in many ways. Antibodies bind to microbes and prevent them from infecting cells, thus "neutralizing" the microbes and blocking their ability to infect host cells or to colonize tissues. 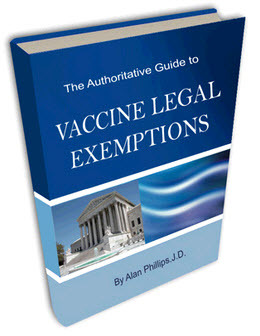 In fact, antibodies are the only mechanisms of adaptive immunity that prevent an infection from becoming established; this is why eliciting the production of potent antibodies is a key goal of vaccination. IgG antibodies coat microbes and target them for phagocytosis because phagocytes (neutrophils and macrophages) express receptors for the tails of IgG. IgG and IgM activate the complement system, by the classical pathway, and complement products promote phagocytosis and destruction of microbes. Some antibodies serve special roles at particular anatomic sites. IgA is secreted from mucosal epithelia and neutralizes microbes in the lumens of the respiratory and gastrointestinal tracts (and other mucosal tissues). Maternal IgG is actively transported across the placenta and protects the newborn until the baby's immune system becomes mature. Most antibodies have half-lives of a few days, but some IgG antibodies have half-lives of about 3 weeks. Some antibody-secreting plasma cells migrate to the bone marrow and live for years, continuing to produce low levels of antibodies. The antibodies that are secreted by these long-lived plasma cells provide immediate protection if the microbe returns to infect the individual. More effective protection is provided by memory cells that are activated by the microbe and rapidly differentiate to generate large numbers of plasma cells. 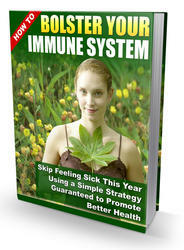 An effective immune response eliminates the microbes that initiated the response. This is followed by a contraction phase, in which the expanded lymphocyte clones die and homeostasis is restored. The initial activation of lymphocytes generates long-lived memory cells, which may survive for years after the infection. Memory cells are more effective in combating microbes than are naive lymphocytes because, as mentioned earlier, memory cells represent an expanded pool of antigen-specific lymphocytes (more numerous than naive cells specific for the antigen), and memory cells respond faster and more effectively against the antigen than do naive cells. This is why generating memory responses is another important goal of vaccination. We will discuss the properties of memory lymphocytes in later chapters. In the remainder of the book, we describe in detail the recognition, activation, regulation, and effector phases of innate and adaptive immune responses. The principles introduced in this chapter recur throughout the book. When an antigen enters, it selects a preexisting clone and activates it. ?